Congress should raise the cap on the passenger fee, now set at $4.50, which would help fund improvements in Portland and Bangor. We all understand the importance of our nation’s infrastructure, and there has been much talk around the country about infrastructure investment. Thankfully, within aviation, we already have a proven, user-funded program – one that is not a tax – to support airport infrastructure. The airport passenger facility charge is a locally approved fee, paid by departing passengers, that airports may choose to collect to support needed infrastructure investment. Since its inception in 1990, this charge has helped airports mitigate aircraft noise and increase safety, security, competition and capacity. Large and small airports around the country rely on passenger facility charge revenue to finance infrastructure projects, including new runways, taxiways and terminals, which are critical to our economy. Paul H. Bradbury is director of the Portland International Jetport, and Anthony P. Caruso Jr. is director of the Bangor International Airport. The Portland International Jetport (PWM) and Bangor International Airport (BGR) are no exception. In Portland, the passenger facility charge was successfully used to increase competition and improve infrastructure, most recently to fund the $72.4 million terminal expansion completed in 2012. This expansion provided needed security, safety and capacity improvements that are now driving record passenger volumes to our state. Similarly, in Bangor, $4.9 million in passenger facility charge revenue was used to fund a $14 million terminal rehabilitation project aimed at improving efficiencies, managing rising demand and increasing competition. If not for the airport user-funded passenger facility charge, these projects, which serve millions of travelers each year, would not exist. Investments in airport infrastructure provided by the passenger facility charge have paid big dividends for Maine. PWM and BGR are the air gateways between Maine and the world. They are economic engines for two of the largest cities in Maine and the entire state. Economic impact studies show PWM and BGR have a combined annual economic impact of nearly $1.5 billion and support 13,200 jobs. It is critical for Maine businesses and citizens to have a robust connection to the national and global air-transportation system. This can be accomplished only through continuing investment in and support of our local aviation infrastructure. PWM recently completed a Sustainable Airport Master Plan outlining infrastructure needs over the next 20 years. The plan includes over $270 million worth of infrastructure investment that will be needed within this time frame. The passenger facility charge is a critical part of the funding for this plan, providing $67 million of the total. In the short-term five-year plan, the passenger facility charge will help fund international processing facilities, passenger boarding bridges and gate concourse rehabilitation. It is no longer good enough to have great domestic connections for air service; we must also have the capability to accommodate new airlines from around the globe that want to serve the state of Maine. These accommodations are not possible without the user-supported investment provided by the passenger facility charge. Congress has not increased the cap on passenger facility charges from the current level of $4.50 for 17 years, meaning that the funding capacity of the program has not kept pace with inflation or the infrastructure needs of airports. The $4 increase being debated by Congress would be limited to origination airports like PWM and BGR; it could not be charged at connecting airports. Additionally, any local increase to the passenger facility charge must be approved by the airport’s owner. For PWM and BGR, this would be the Portland and Bangor city councils. So even with congressional approval of the increase, there must still be local support of and agreement on any proposed passenger facility charge-funded improvements. It is critical for Maine businesses and citizens to have a robust connection to the national and global air-transportation system. This can be accomplished only through the continuous investment and support of our local aviation infrastructure. The user-supported, locally implemented, non-tax-based revenue provided by the passenger facility charge is a proven and successful program for funding airport infrastructure. Congress can and should take the next step in approving an overdue increase to the passenger facility charge. 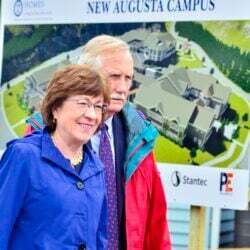 We appreciate the efforts of our senior U.S. senator, Susan Collins, to help Maine’s airports. She recognizes and appreciates the tremendous economic value they bring to businesses, residents and communities throughout our state. Commentary: Will Iran resolve its unrest through peace or violence?